The Raahgiri movement is bringing car-free Sundays to cities across India, spreading the principles of sustainable, active transport. Photo by Shamim Khan/Facebook. 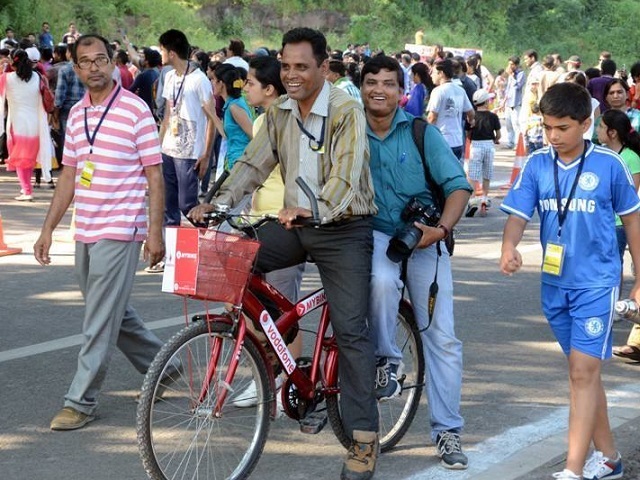 On September 21, 2014, Bhopal became the fifth city in India to implement the weekly open streets movement, Raahgiri Day. Organized by the Bhopal Municipal Corporation (BMC), Traffic Police, and Bhopal City Link Ltd. (BCLL) in collaboration with EMBARQ India, the event began at 6am and witnessed an overwhelming first day turnout. 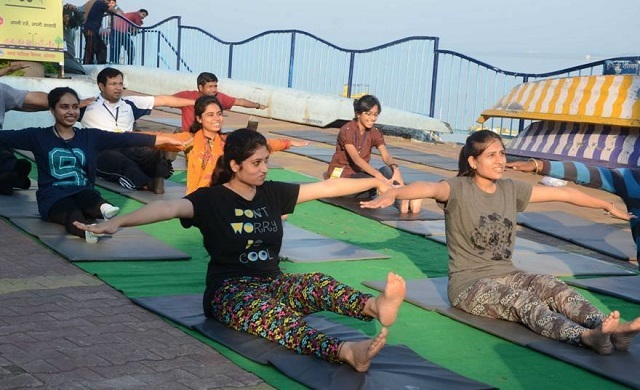 Over 10,000 people from all over the city participated in the event at Bhopal’s Boat Club Road on the shores of Lake Bhojtal. Raahgiri Day is India’s first sustained car-free day, first launched in Gurgaon – India’s “Millennium City” – on November 17, 2013. Roughly 10,000 people participated in the inaugural event and now over 500,000 Indian city dwellers have participated in car-free Sundays, including in the country’s capital and largest city, New Delhi. 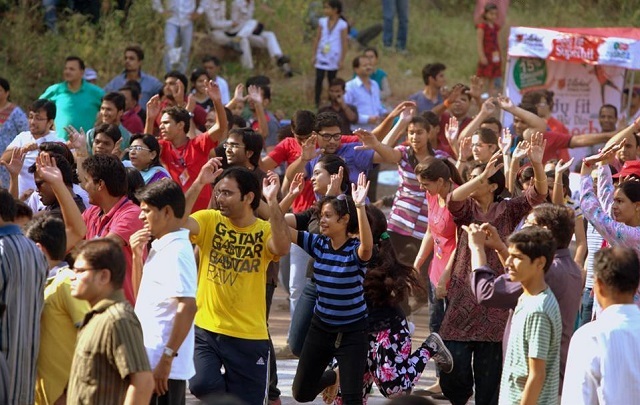 Bhopal’s rendition of Raahgiri Day saw special programs including fitness dancing, exercises, rangolis, cycling, skating, and sports including cricket, soccer, badminton, hockey and yoga. The Commissioner of BMC, Ms. Tejaswi Naik, also actively participated in a game of hockey with a group of children. Traffic police and officials patrolling the stretch did so on bikes. For the first time at a Raahgiri event, a computerized bike rental system was available. 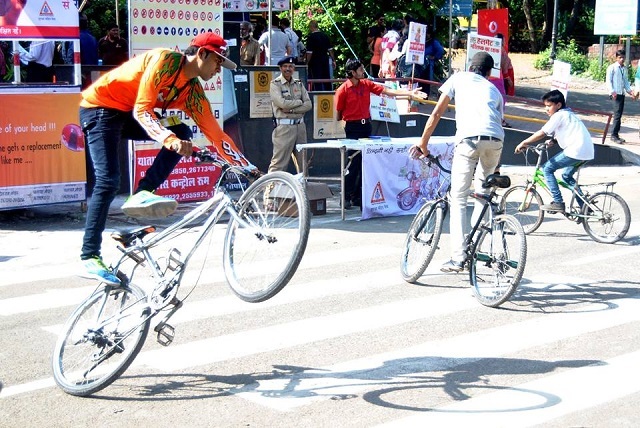 Large crowds came out to participate in a variety of activities on this car-free road in Bhopal. Photo by Ajita Shrivastava/Facebook. Traffic police officials gave important information about road safety, educating people about traffic signals, safe driving, and the importance of wearing helmets. Participants brought large banners that read “city for people, not for vehicles.” Environmental experts were also on hand to speak with visitors about to the importance of protecting and preserving our environment for future generations. Instead of carrying cars – which contribute to the air pollution that causes over 600,000 premature deaths in India annually – Boat Club Road gave residents the opportunity to be physically active and improve their health. Photo by Shamim Khan/Facebook. Bhopal is the 14th largest city in India and is known as the “City of Lakes” for its various natural and artificial lakes. In recent years, Bhopal has witnessed a gradual increase in vehicle ownership. Civic bodies have adopted different measures to retain the existing mode share of cycling and walking in the city, which is still relatively high. Raahgiri Day is an effort to advance this vision. The city installed widespread outdoor marketing and advertising at major intersections and popular market places prior to the event to raise awareness. In addition, an engaging social media campaign via Facebook informed supporters and participants about key events for the day. Text messages were sent to people in the BMC database, and several buses played Raahgiri Day videos in the lead up. The media, especially The Times of India, were actively involved in publicizing the event. Bikers take advantage of new access to public spaces at Raahgiri Day. Photo by Raahgiri Day, Bhopal/Facebook. Raahgiri Day, India’s car-free Sunday movement, is gradually expanding across the country. With the ‘Raahgiri revolution’ comes an opportunity for India to promote broader solutions for sustainable cities. Read more about Raahgiri Day in Gurgaon, New Delhi, and elsewhere on TheCityFix. A version of this article was originally published on EMBARQIndia.org.